For just a couple of weeks in late June some Thomson Holiday European short haul customers are going to find themselves on the new Boeing whilst the aircraft is carefully introduced. 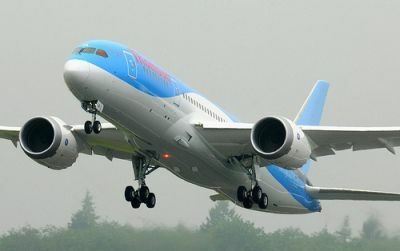 Hence on 21 June unsuspecting passengers on an early morning flight from Gatwick to Mahon are likely to find themselves the first Brits to fly on a UK-registered Boeing 787. Thomson claims that its offering is often better than the equivalent legacy operation on the same route. Comparisons with whatever British Airways shortly comes up with, in Economy and its upgraded World Traveller Plus classes, are bound to be made. On 8 July business begins in earnest with long haul inaugurals from Glasgow to Cancun (Mexico) and Manchester to Sanford, Florida. The next day Gatwick gets into the act with a flight once again to the popular Mexican resort. By August, with four 787s in service, the aircraft will be seen on selected services out of East Midlands, Gatwick, Glasgow and Manchester to Cuba, Dominican Republic, Jamaica, Mexico, Maldives, Mombasa and Thailand. Thomson Airways is a true long haul international airline. The aircraft has 244 seats 3+3+3 in a 33-inch seat pitch Economy Class and 47 in what the airline calls Premium Club, 2+3+2 with a 38-inch pitch. Whilst the UK taxation rules state that anything over 40 inches is treated as what they call “standard rate” for Air Passenger Duty (APD) purposes, the same Treasury document also says that passengers on a two-class aircraft pay the extra fee. As possibly a Government PR stunt the Economy Class is called “reduced” which does not mean reduced at all, but you are paying half the tax as Premium Club. As a traveller you do not normally win when it comes to the Treasury, but in the case of those lucky Mahon folks who might find themselves in the front of the plane the ‘forced’ upgrade is unrequested and not subject to the extra fee. 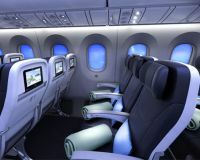 The 787 brings a major upgrade both with what is on offer to the passenger and in terms of efficiency for the airline. Passengers will be flying at an assumed nominal 6,000ft rather than the 8,000ft hitherto. This should make for a more relaxed flight, and less chance of headaches and dizziness. The windows are 30% larger than the norm and have electric dimmers instead of blinds. The latest LED lighting system changes the brightness as the flight continues with the idea that there should be no customisation problems at the other end. The nine-inch screen IFE system allows client to plug in their own iPads and there is a good selection of films for both adults and children available. On the environmental front the new aircraft uses 20% less fuel than current generation planes and reduces noise by up to 60%. 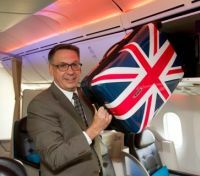 When it comes to in-flight service Thomson say they are making a great effort with the 787 to ensure the catering is worthy of the aircraft. Premium Club passengers can use Fast Track at some airports plus priority boarding and complimentary pre-departure drink. There is a dedicated cabin and crew, an amenity kit from luxury cosmetics brand Rituals, magazines and newspapers, a four-course meal, plus specially-designed kids’ meals and a light bite before landing. A range of complimentary drinks is offered plus Starbucks coffee. Thomson Airways is the world's largest charter airline and Britain’s third biggest air carrier after easyJet and British Airways carrying just over 10m passengers in 2012. It flies from 20 UK airports to 88 destinations around the world. It is an amalgamation of a number of UK airlines over the years, most notably Britannia Airways from 1964 until May 2008. That year Thomson Airways was created following a merger with First Choice Airlines (formerly Air 2000). The airline currently operates 32 Boeing 737-800 (189 seats), eight Boeing 767-300ER (these vary in layout with a maximum of 325 and 62/196 seats), 16 Boeing 757-200 (235 seats). The order for Boeing the 787 stands at 13. TUI, the owner of Thomson Airways, is likely to place a major order later this year for up to 120 aircraft including the replacement of its aging, but popular Boeing 757 fleet. It is the world’s largest operator of the Rolls-Royce RB 211 engine and currently totally Boeing. But Seattle should not get complacent. When it came to the power, choice of GEnx or Rolls Trent for the 787, the engineers could not split the product according to Chris Browne, the deal going to General Electric on price.